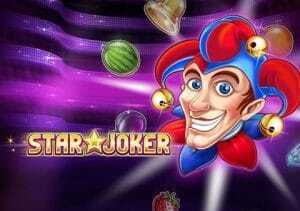 With a name like Star Joker you might expect a space themed video slot or an intergalactic adventure. It is in fact a very simple fruit machine from Play ’N Go. Played using a 5 reel, 10 payline machine, this low variance game comes with a bonus round that awards up to 20 free spins where the scatter also acts as a wild. Play on your PC, tablet or mobile device from between 10p and £100 per spin. The design here is very simple. On the purple reels you’ll find a collection of symbols commonly associated with fruit machines. The lowest payers are the cherries and strawberries which award up to 10 times your bet per payline. They’re followed by the plums, melons and oranges which pay up to 15 times your bet per line, the golden bell which delivers up to 25 times your bet and the diamond which awards up to 50 times your bet. The top payer among the standard symbols is the lucky 7. Land 2, 3, 4 or 5 of these in combination and you’ll receive a payout of 0.5, 5, 20 or 100 times your bet. The star is the game’s wild. It can hit on all 5 reels and substitute for everything apart from the scatter. Land 2, 3, 4 or 5 wilds in combination and you’ll pocket an award of 1, 10, 100 or 500 times your bet. Star Joker comes with a Free Spins feature – it’s triggered by landing the joker scatter on reels 1, 3 and 5 on the same spin. You can then look forward to 10 free spins. During the free spins, the joker serves a dual purpose. As well as acting as a scatter, it also serves as a wild. Landing 3 jokers will get you a re-trigger and another set of free spins. Many simple fruit machines ramp up the variance. That’s not the case here. In fact, the volatility here is low. Expect plenty of play for your investment. Despite this, you can still win a cool 5,000 times your bet on every spin! You won’t find anything exotic here. If you fancy a quick spin on an old school machine, then that’s just what you’ll find when you fire up Star Joker. If you want more variety, Play ‘N Go has plenty of alternatives with Gunslinger: Reloaded and Viking Runecraft 2 I play regularly.